Spill containment is where spills of chemicals, oils, sewage etc. 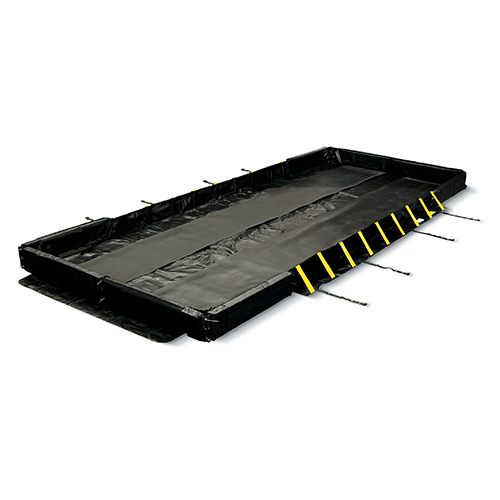 are contained within a barrier or drainage system rather than being absorbed at the surface. One method is to use an inflatable stopper or pneumatic bladder which is inserted into the outflow of a drainage system to create a containment vessel. In the event of a spill the stopper bladder is inflated to block the drain/s and to prevent the spilled agent from entering the ground water, stream or river. The National Response Center (NRC) reports over 10,000 annual spills in the US from facilities. All of these can employ the spill containment measures mentioned above. Spill containment is considered by some to be a more eco-friendly solution than using absorbent spill kits that have very small capacity, require disposal after use and do not permit re-cycling of the spilled agent. Chemical handling and oil transfer companies in the UK are now deploying spill containment bladders and valves that can be retro-fitted to existing drainage systems in just a few hours. Remote control of the inflation process is also available eliminating risk to operatives in the event of hazardous chemical spills. Normally controls are pneumatic eliminating the need to run electrical cables down into the drainage system. The latest technology in wireless spill containment eliminates any infrastructure changes using a wireless network which inflates bladders that employ disposable gas cylinders. The wireless plugs enable spill containment in virtually any location. Using the ZigBee network enables the user to connect any type of component to the wireless system such as sensors, fire alarms, panic buttons, remote controls etc. Drains of all sizes can be fitted with systems available with extension brackets that cater for drain depths from 500 mm to over 2.5m deep. There are also pneumatically controllable flap valves or pneumatically controlled non-return valves which can be fitted to existing soil waste systems. Again containment is controlled by application of pneumatic pressure in the event of a spill.